Sean Rafferty presents, with performances in the studio from the Southern Cone Quintet and Baroque violinist Bjarte Eike. Plus conductor Laurence Equilbey in conversation. Sean Rafferty with a lively mix of music, chat and arts news, with live performance in the studio from the Southern Cone Quintet playing contemporary arrangements of traditional Latin American forms. 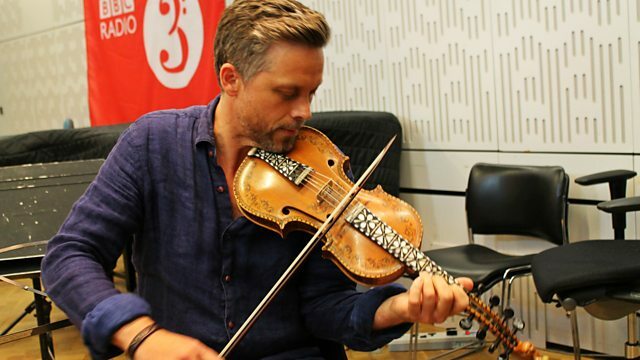 French conductor Laurence Equilbey talks about her period instrument group Insula Orchestra ahead of their concert at the Barbican in London, plus Norwegian baroque violinist Bjarte Eike plays live in the studio with a taster of The Image of Melancholy - the programme he is performing with his period band Barokksolistene in the Sam Wanamaker Playhouse at Shakespeare's Globe.. Performer: Dominika Feher. Performer: George Clifford. Ensemble: Amade Players. Conductor: Nicholas Newman. Handel: Agrippina: John Eliot Gardiner. Singer: Jonas Kaufmann. Singer: Kristine Opolais. Orchestra: Santa Cecilia Academy Rome Orchestra. Conductor: Sir Antonio Pappano. Singer: Franco Fagioli. Orchestra: Insula Orchestra. Conductor: Laurence Equilbey. Orchestra: Boston Symphony Orchestra. Conductor: Bernard Haitink. Brahms - Symphony No.3 - Alto Rhapsody. Performer: James Rhodes. Music Arranger: Grigory Ginzburg. Bullets & Lullabies; James Rhodes. Singer: Berit Norbakken Solset. Orchestra: Barokksolistene. Director: Bjarte Eike. Ensemble: Barokksolistene. Director: Bjarte Eike.